Two NATO-led soldiers were killed and six wounded in an attack at a U.S. base in eastern Afghanistan early Sunday, officials said. 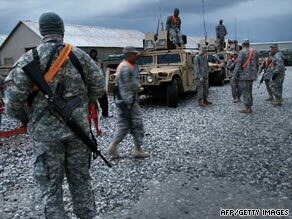 The soldiers were serving with the International Security Assistance Force, the organization said in a statement. The attacks occurred at Bagram air field. The injured were being treated at the base, according to the statement. The security force does not release the nationality of casualties before the relevant country officials. Bagram is home to thousands of troops from all branches of the U.S. military. The majority of the troops do not leave the base and are in various support roles for U.S. troops across Afghanistan. “On behalf of ISAF, I share our grief and extend our support to the loved ones of these service members,” said Brig. Gen. Richard Blanchette, a spokesman. “As we continue this vital mission in support of the Afghan people, we will remember this sacrifice with honor and the utmost respect.” The international alliance was formed under a U.N. mandate to bolster a secure environment and support the reconstruction of Afghanistan. NATO took command in 2003. The force comprises about 50,000 troops from 42 countries, according to its Web site.